After writing articles helping people to install OpenCV here on this blog, some asked me to share a little more about OpenCV, not just the installation part. I started thinking about a way to deliver this information when suddenly Packt publishing contacted me about making a video course tutorial for OpenCV. I knew it was the perfect solution, so I immediately said yes. 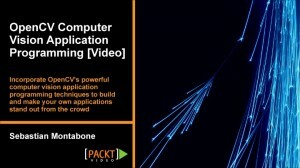 After the publication of the video course at Packt, I was glad to see it appear also in the official website of OpenCV. This video course starts right at the beginning, with an explanation of what OpenCV is and its installation. Then, you learn all the basics of OpenCV, followed by some of the basics of image processing. Then, you will be ready to detect objects, recognize faces, train your own detector, remove distortion from your photos, and play with images in 3D. Development with OpenCV using the recommended C++ interface, as well as an introduction to the Python and C interfaces. This is an easy to follow video course for people that are just starting with OpenCV. Even people that are used to OpenCV may benefit from some of the more advanced videos since you can just pick and choose which video you want to learn from. You can check out the video course here. Right now it does not have subtitles or transcripts as far as I know. Nevertheless, I contacted Packt (the publisher) and asked about it, maybe they could help with this. I am working through your nice video and the source code. Unfortunately, there is some source code missing (the folder for Chapter 7.1: “Calibrating your camera” only contains the pattern). I would appreciate your help. I’m happy to hear that you have liked my video course so far. For the particular video that you are referring to (7.1 – Calibrating your camera) I do not use any custom source code, that’s why no source code was provided for the video. I only use built samples that come directly from OpenCV, specifically imagelist_creator, and calibration. So you should be able to calibrate your camera without doing any coding at all! I also buy your video, and it’s great. By the way, how can I get the 4 input test image in section “5.1 Creating a Panorama”? I am glad you liked the video course. It does not happen within the python interface. They are running smoothly so far. I was able to find the problem. The path to the image was not properly defined. Your code was fine. It was my error. I am very happy that you have been enjoying the video course, and it is great to hear that you already solved your problem. Unfortunately the video is not free. You can try contacting the publisher directly to see how to arrange a different form of payment. Sorry about that. i am new in OpenCV so i bought your video tutorials to help me with my work. But i just wanna ask you for an advice. With my camera I want to detect in a room common things like tables, chairs, paintings on the wall, TV, clocks and so on. What TIPS, TECHNIQUES, OPENCV features or what would you recommend me to focus on to achieve this? I will be really grateful. Thank you very very much for your response. The first that I would do is think about the problem. Can it be solved with something else that is not computer vision?, maybe it is a really simple problem using other type of sensor or framing the problem in another context. Can you at least use 3d data?. Sometimes it is much easier to understand what is happening in the world when you actually have 3d data instead of just 2d data like images. If after thinking that you still need to solve that problem using computer vision, then I would suggest you to start reading about the feature detection module of opencv. That would give you a nice starting point. The video tutorial explains the theory behind, as well as the implementation. In the first few videos the different OpenCV APIs are explained, C/C++, Python, etc. But after that, the rest of it is only in C++, the recommended language for using OpenCV right now. So, you will get to see how to install the library, and how to start doing things in OpenCV with Python, but the main focus of the tutorial is C++. Dear Sebastian, I am a student at India. I am trying to buy your video course online. But, somehow PayPal is not accepting the currency and credit card option is also not working. Could you pleas suggest me any other alternative to buy this course. Hi sebastian…Its really Helpfull tutorial i followed it and it made possible to me to work seamlessly on Opencv for Imageprocessing applications. what that change should be??? The sample code only reads an image, but you can easily change it to the webcam. 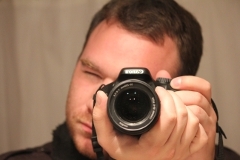 Take a look at the other samples, like lkdemo.cpp which uses the camera by default. I’m running opencv 3.0 on CentOS 7 and I figured out I must need to install the extra modules. I downloaded from https://github.com/Itseez/opencv_contrib and followed instructions and everything compiled fine but I still get the same errors. Would you know what I’m doing wrong? Thanks so much for the help! I am glad that you are enjoying the video course!. It seems that the face recognizer demo was relocated in OpenCV 3. To make it easy, just download OpenCV 2.11 and you should be able to follow the video course. “The first that I would do is think about the problem. Can it be solved with something else that is not computer vision?, maybe it is a really simple problem using other type of sensor or framing the problem in another context. Can you point me to techniques using 3D data that might be useful? There are many techniques that can be directly applied to 3D, or even higher dimensions. Topics like PCA, clustering, and data mining in general can easily be used in the 3D case. There are also specific features that are used in 3D. Some examples of them are PFH (Point Feature Histogram), NARF (Normal Aligned Radial Feature), SHOT (Signatures of Histograms of Orientations), VFH (Viewpoint Feature Histogram), and many others. Hi Sebastian, I want to take the course, I need to know if the course also contains some information about AAM and Poseit ? Hello Aditya, this course in particular does not cover Active Appearance Model(AAM) or Posit.